Some auto accident injuries are immediately apparent, while others may not manifest clear symptoms at first. Of the latter type of injuries, one of the most common is mild traumatic brain injury, better known as a concussion. While a concussion may not seem as severe an injury as, for instance, a spinal cord injury, it can have serious short-term, long-term, and even permanent consequences. The personal injury attorneys of the Law Office of Gary A. Zucker & Associates, P.C. have extensive experience handling the full range of auto accident cases, including those involving concussions. Each year there are thousands of Brooklyn auto accidents; concussions are among the injuries most commonly experienced by victims. If you have suffered a concussion in an auto accident that was caused by someone else’s negligence, you may be entitled to compensation for your medical bills, lost wages, pain and suffering, and other relevant losses and expenses. Our auto accident attorneys can help to ensure that you feature the full measure of damages to which you are entitled. A concussion is a closed head injury that occurs when the brain is shaken by a sudden jolt or a blow to the head. People who suffer concussions experience temporary loss of brain function. In most cases, the symptoms of concussion pass quickly, if they are apparent at all. Indeed, many people who suffer concussions as a result of car, truck, or motorcycle accidents believe that they have emerged unscathed. In most cases, these symptoms do not last long. However, this does not mean that the brain is undamaged or that the injured victim is in the clear in terms of his or her long-term health. In between 5 and 10 percent of concussion cases, accident victims have post-traumatic seizures, sometimes years after their auto accidents. In some cases, the concussion is accompanied by bleeding into the brain, which can result in permanent post-traumatic epilepsy. Occasionally, what appears to be a mild concussion is actually permanent brain damage, which can lead to severe emotional disorders such as depression even years after the fact. 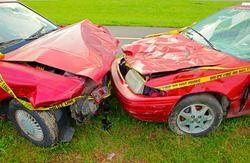 If you have suffered a concussion in an auto accident caused by someone else’s reckless, distracted, or otherwise negligent driving, you shouldn’t have to shoulder the financial consequences on your own. Our lawyers can help to ensure that the person responsible for your injury and the resulting losses and expenses is held accountable. We can build the strongest case on your behalf, using all of the resources at our disposal to investigate and reconstruct the accident in which you were injured. To learn more about litigation involving concussions or to arrange for an evaluation of your auto accident case, please contact the Law Offices of Gary A. Zucker & Associates, P.C. today.